SwimWalks have developed from a misorder of 200 Ocean Blue swimming caps. 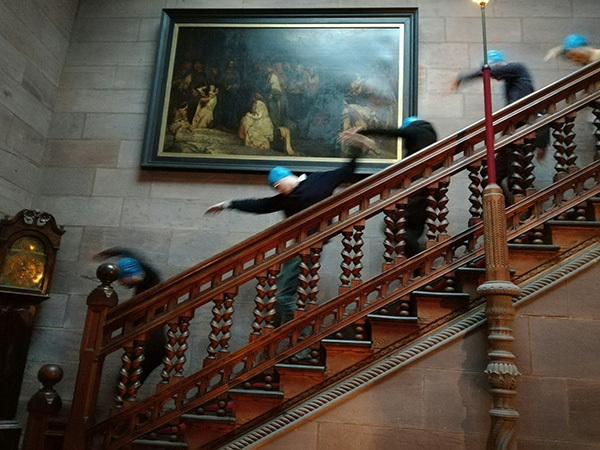 The first ever SwimWalk took place at Hospitalfield House open day in 2016, as part of my residency there. SwimWalks are choreographed participatory non-verbal walks that involve swimming strokes, without the requirement to get wet. A SwimWalkSwim does involve getting wet, and the first one of these events started at the Scottish National Gallery Of Modern Art One and ended at the Drumsheugh Baths, where participants had the opportunity to test the waters and trapezes in this exclusive Victorian building. SwimWalk(Swim) Tormore took place during the (w)ORD residency on the lsle of Mull starting at Tormore Quarry and ending at the beach, with a choice to end up in the water or not. SwimWalk Edinburgh Printmakers was created to coincide with the Translating Travels exhibition (4th April - 21st July 2018) and led walkers from Union Street to Union Canal - the current and future Edinburgh Printmaker venues. Participants were rewarded with laser-cut oatcake medals during the Union Canal Festival.